The Lower Limb LCD Policy Proposal, despite being just a draft proposal, is now being felt in the private sector: United Health Care has now deemed vacuum pumps as not medically necessary, effective October 1, 2015. Read the policy now. We promise to continue to keep you posted on the UHC issues, but we have also received an early indication about another mischievous outgrowth of the commercial sector jumping on the draft LCD as an opportunity for cutbacks–this time from one of the state BCBS plans. We are waiting to see documentation, but if this proves correct, we will again communicate with the insurer AND communicate to CMS (as we did when the UHC policy first arose) underscoring yet again the need for a quick decision to rescind the draft LCD. Read this news article published in the Minnesota Star Tribune. Over 100,000 people took President Obama at his word when they shared their names, email addresses and trust in/commitment to government, signing on in 17 days to surpass the 100,000 signatures required to prompt direct White House intervention and action on the draft lower prosthetic LCD. Others were skeptical, seeing the ‘We the People’ process as 90% public relations and only 10% substance. Well, the first response from the White House did nothing to dissuade the PR skeptics. On Friday evening that report did not represent any action by the White Hiouse on the petition as had been promised. Rather, it did precisely what the President frequently criticizes Congress for doing–the White House report simply kicks the can down the road. It engages in a pious promise to eventually do what’s right, without giving either a hint of what the substantive action might entail, or when a final substantive decision will be rendered. * it occurs 15 days after the first of an expected stream of commercial payers began embracing this very deficient draft as if gospel, as a premise to invoke the misguided draft’s content as an excuse to cut costs, ramp up profits, and downgrade amputee care. That’s too long! Inaction and failure to rescind this deficient policy now allows it to disenfranchise amputees, sadly in the year when the Administration touted the 25th anniversary of the Americans with Disabilities Act! Thanks for using We the People, and for sharing your concerns about the local coverage determination for lower limb prostheses proposed by Medicare contractors. In order to get the most up-to-date information concerning your petition, we’ve gone to the Department of Health and Human Services (HHS) — specifically, the Centers for Medicare and Medicaid Services (CMS), and the Administration for Community Living (ACL). You can learn more about LCDs and how they’re determined here. The coverage determination process is still ongoing, but CMS wants to make clear that they’re committed to providing high quality care to all Medicare beneficiaries. They also wanted to make sure you know that HHS has met with stakeholders on this important issue, and both CMS and its contractors understand the questions that have been raised about access to the right prosthetic care — including related technologies — for Medicare beneficiaries. We will be in touch with another update. See the petition and response on the “We the People” website. *OIG Report missed that the 2005-10 increases reflected initial private sector availability of quantum leap in technology stemming from Iraq/Afghanistan, federally funded research to improve amputee care. 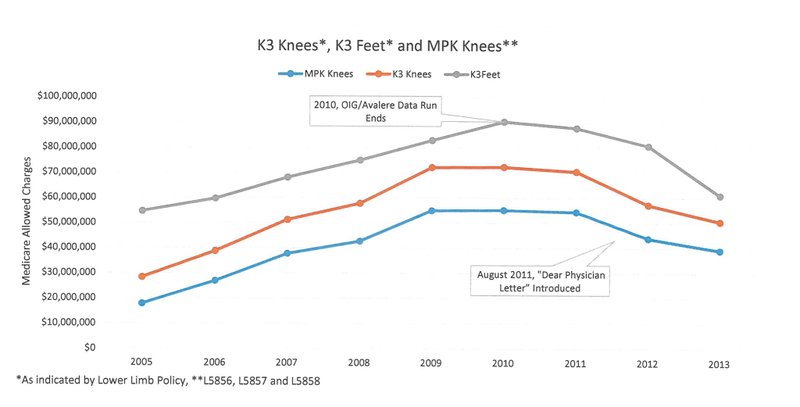 The data proves that related cost increases for 2005-10 had already started to decline before OIG, “Dear Physician and RACs drove down quality of care to try to reduce Medicare expenditures that unbeknownst to them had already started to fall. Copyright, 2015, American Orthotic and Prosthetic Association. All Rights Reserved.